Non Ferrous metals don’t contain iron, are non-magnetic and are usually more resistant to corrosion than ferrous metals. 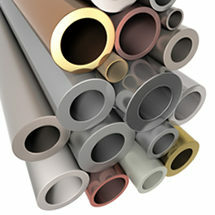 This wide variety of properties makes non ferrous metals very versatile. As a result they are often used for structural applications and situations where you require reduced weight. They are also very strong and ideal for situations where magnetic properties are not required. They also offer higher melting points than other metals and resistance to chemical and atmospheric corrosion. Through our extensive network of contacts, we can supply you with any non ferrous metals such as aluminium (alloys, bronze and pipes), perforated aluminium, copper alloys, nickel alloys, bronze and brass. Not only that, but we can also provide you with the metal finished to your exact specifications through our extensive sub-processing services. Plus deciding on the right material for the job in hand can be difficult, so if you have any doubts give us a call and we will offer any help we can. No matter what size of order you are looking for – whether it is a small one-off order or something much larger – give us a call and put us to the test. We will use our experience, knowledge and extensive network of contacts to find exactly what you need, when you need it and at the best possible price. To find out more, call now on 0800 0113 091 for all your non ferrous metal sourcing needs.